Maria Callas, the legendary opera star, was according to the NY Times the greatest singer of the 20th Century. She died in 1977, but she performs in a new concert with a live orchestra. A company called Base Hologram is using an old technique called Peppers Ghost with new technology. They are offering the result in a performance called “Introducing Callas in Concert” to selected theaters and performance venues. Roy Orbison will also perform in a hologram called “In Dreams: Roy Orbison in Concert” which opens this April 2018 in the UK. Above Roy Orbison look-a-like/impersonator with the digital face and audio from the real Roy Orbison. These three dimensional holograms are the latest in a series of music performances that have included Tupac Shakur and Michael Jackson. 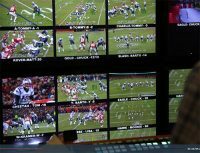 The new technology will be used to combine theatrical productions with holograms and laser technology. The performers can sing alongside a live orchestra. The hologram uses Epson’s Pro L-Series laser projection. While it may look somewhat like a hologram and that’s what many call it, it is actually not a hologram. It’s more like a 3D projection. The company that produced it calls it HologramUSA Eyeliner™. The 3D projection relies on an illusion technique called Peppers ghost which was first used over 100 years ago in carnivals and amusement parks. Peppers ghost uses mirrors to project an image. This technique creates the modern day appearance of “Ghosts” at the Haunted Mansion and the “Blue Fairy” in Pinocchio’s Daring Journey at the California Disneyland park. This same technique of light reflected from a glass is also used in teleprompters. 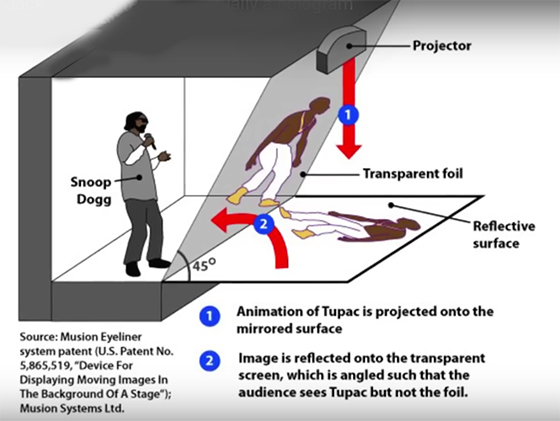 The diagram above explains how Peppers Ghost works to pair Snoop Dog and Tupac in a concert that never was. In the case of Maria Callas and Roy Orbison, it is not their bodies, but a look-a-like/impersonator. The face, however, is a digital version of the real faces of Maria and Roy respectively. The face is matched with footage of the real Roy and Maria and then merged with their look-a-like bodies. The look-a-like impersonator is filmed from all sides with motion cameras which is what gives it the 3D look. The audio track takes a real recording and strips the music accompaniment so the performer can sing with a new live orchestra. Audio programs like Audacity can strip the music while leaving the voice untouched. Other programs that can do this include Wondershare Filmora and the Center Channel Extractor effect in Adobe Audition CC.